Since methane, the primary component of natural gas, is both a potent greenhouse gas and a valuable energy source, the state is setting itself up well for a strong two-pronged strategy. Gov. Lujan Grisham has directed the EMNRD and Environment Department to work cooperatively on complementary, but not duplicative, rules. The EMNRD’s Oil Conservation Division would develop statewide rules focused on cutting energy and revenue waste from practices like venting and flaring. Meanwhile, since methane leaks allow other dangerous co-pollutants like cancer-causing benzene and smog-forming volatile organic compounds to escape, the Environment Department’s Air Quality Bureau could complement these efforts with its own set of requirements focused on improving air quality. 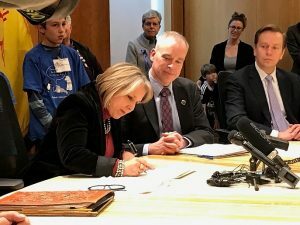 This approach would address the problems of methane waste and air pollution related to oil and gas development in the most holistic way possible: both as an issue that wastes $240 million in New Mexico natural gas resources every year, and as an air pollution problem that increases ozone and smog in the state’s biggest oil and gas counties. New Mexico is in the midst of a drilling boom, but without strong regulations on the books, every new well is another source of wasted resources. In the air quality realm, action to reduce pollution is required under state law where ozone levels are within 95 percent of the federal health-based standard. Currently, counties including San Juan, Eddy and Lea – not coincidentally the state’s largest oil and gas production centers – are within that danger zone. It only makes sense that the state with the worst oil and gas methane problem in the nation, the weakest current regulations (after eight years of policy retreats) and the country’s most active drilling basin should step out to create the strongest, most comprehensive regulations it can as quickly as possible. Thanks to the leadership of Gov. Lujan Grisham, the road ahead in New Mexico appears to be fast leading to a brighter future for state revenue and air better protected from oil and gas pollution. This entry was posted in Air Quality, Methane, New Mexico and tagged air quality, Methane emissions, New Mexico. Bookmark the permalink. Both comments and trackbacks are currently closed.